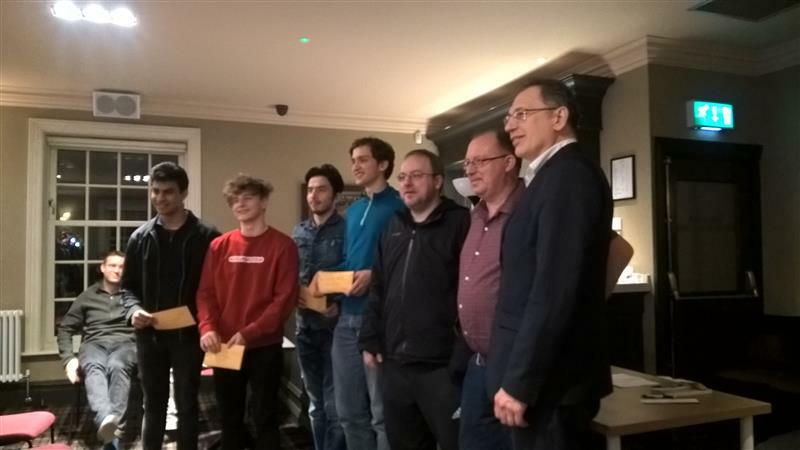 The Northumbria Masters is a new five day, nine round chess event sponsored by Capital Bridging Finance Solutions Ltd, which was held in February this year in the upstairs function room of the Chillingham Arms Pub in Newcastle. The function room had excellent sound proofing and complimentary hot drinks and biscuits. After each round of chess players were able to use the large downstairs rooms of the pub to analyse their games with their opponents with some decent pub food and drinks. The tournament consisted of around 50 competitors from 14 different countries. Many strong players entered the event which was eventually won by German International Grandmaster and top seed, Alexander Donchenko. Donchenko, pictured in the middle of the picture below wearing a blue top, scored 7.5 points from 9 rounds, beating Suffolk's Alan Merry in round 2. Ravi Haria (IM), Martin Percivaldi (IM), Jakhongir Vakhidov (GM), Alexander Donchenko (GM), Daniel Gormally (GM), Tim Wall (Organiser/FM) and Alexander Raetsky (GM). You may (or may not!) ask yourself, "why was the tournament so strong"? One reason is obvious: money. The bigger the prize fund, the more likely it is that stronger players, including professional players, will turn up to play. The top prize of £1200 may at first sound like a good deal for a working week for a top player like Donchenko, but if you consider that each game can last up to 4 hours and players usually spend additional time preparing before the tournament and for opponents in advance of each game, then it doesn't sound quite as glamourous, especially since there's absolutely no guarantee at all that any of them will end up on a winning score; there are only very fine margins in terms of the difference in strength between the top players. Another reason why the tournament was so strong was because the tournament was advertised for players with a FIDE ELO rating of 2200 or higher. This is appealing because it offers better opportunites for players wishing to achieve a FIDE title. There was a good representation of Suffolk players present including myself, and International Masters Alan Merry and Adam Hunt. Also, former Suffolk-based International Master, Justin Tan played. The organisers allowed some weaker players like myself to enter to make up the numbers, so they ended up using an accelerated pairing system for the first five rounds, giving the likes of Adam, Justin and Alan stronger pairings than they would get with a standard swiss pairing system, and therefore a stronger chance of achieving Grandmaster normsa, although sadly none of them quite managed it this time. Adam Hunt and Alan Merry scored 5 points, finishing in joint 14th place. Justin Tan scored 4.5 points, finishing in joint 23rd place. Edmund Player scored 4 points, finishing in joint 31st place. The Chess Results website lists the final standings and most of the games are available on chess-db.com. The tournament organisers did a grand job and fingers-crossed the event will keep running and continue gaining support and sponsorship for many years to come. I hope the tournament will inspire similar international events to pop up in other areas of the country. There are now a number of good FIDE-rated weekend congresses in the UK, which is helping British chess a lot. Some of these tournaments disperse the prize fund evenly across the different sections, instead of awarding a higher prizes to the winner(s) of the top sections. I do hope such events will reassess their prize fund allocations as it would surely attract stronger players, which would end up sending a positive vibe through all of the sections - a bit like we see in Suffolk with the wonderfully organised Bury St Edmunds Congress. Over recent years there have been some fantastic initiatives involving chess in UK schools and Suffolk junior chess is thriving. If the British chess nations wish to compete better against chess superpowers such as Russia, Ukraine and the US, as well as the rapidly emerging chess nations such as India and China, there needs to be more tournaments like the Northumbria Masters, giving UK players more local opportunities to play chess at a higher level. At the moment, promising youngsters often have to seek opportunites abroad in order to fulfil their potential, which can be inpractical and ends up costing a lot in terms of money and time. The more chess events in the UK that can tempt larger numbers of professionals and top players to enter, the better the outcome should be for UK chess players of all strengths and ages. Chess orgnanisers should always allocate larger prizes to the top section of any chess event and should keep trying to find innovative ways to attract even greater levels of sponsorship for international, national and regional competitions. From a personal perspective, I managed to gain 1.5 FIDE rating points - not bad for 36 hours of chess! Things would have been better if it wasn't for a horrific blunder in my last round game (see below). I also met up one evening for a few beers with Adam Leigh, a former Bury St Edmunds Chess Club member and Bury Knights Junior Chess Club coach. Adam is studying for a Masters degree in Archeology at Newcastle University, and hopes to return one day to the Suffolk chess scene.